He's been stomping his way to San Diego Comic-Con ever since the first Godzilla: King of the Monsters clip a few days ago. And now today the first trailer is here and it's truly a beast. The film is only the third step in Legendary's growing Monster-verse, which kicked off with Godzilla, then last year's Kong: Skull Island. It will conclude with 2020's Godzilla vs. Kong, and one component we see running through all of these films is Monarch. The monster-hunting organization has a vital role to play and even in this trailer they're right in the middle of everything. But Godzilla can't be the king without opponents to fight, and this trailer gives some incredible glimpses at his iconic foes Rodan, Mothra,and King Ghidora! Behind the camera is Michael Dougherty (Krampus), leading a cast that includes Millie Bobby Brown, Vera Farmiga, Kyle Chandler, Sally Hawkins, Ken Watanabe, Zhang Ziyi, O'shea Jackson Jr., Bradley Whitford, Thomas Middleditch, and Charles Dance. 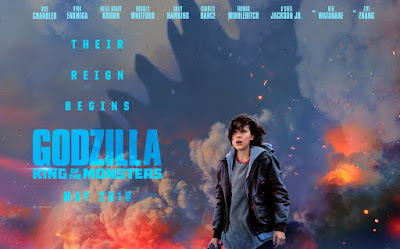 Godzilla: King of the Monsters opens May 31st 2019.